True story: I like the idea of going out to eat but I very rarely do it because I can never make up my mind where to go. Melinda was crashing at my apartment a few weekends ago and we decided we were just too lazy to make dinner and I had no food in the house. So we decided to get take out. 45 minutes later, surrounded by take out menus and coupons, we hadn’t committed to anything yet. We couldn’t decide what we were in the mood for. We couldn’t decide whether we wanted delivery or to go get it. We couldn’t decide on anything. Basically, we just wanted someone to deliver us the best food ever without us having to decide on the food and, we wanted it to be free. We were sort of pathetic. This is what happens to me at least once a weekend, though, when I’m too wiped out to make dinner. I always think, “Pizza can be delivered to me in no time!” and then I see all the other options that are out there and nothing gets ordered. But not this weekend! This weekend, I’m ready! 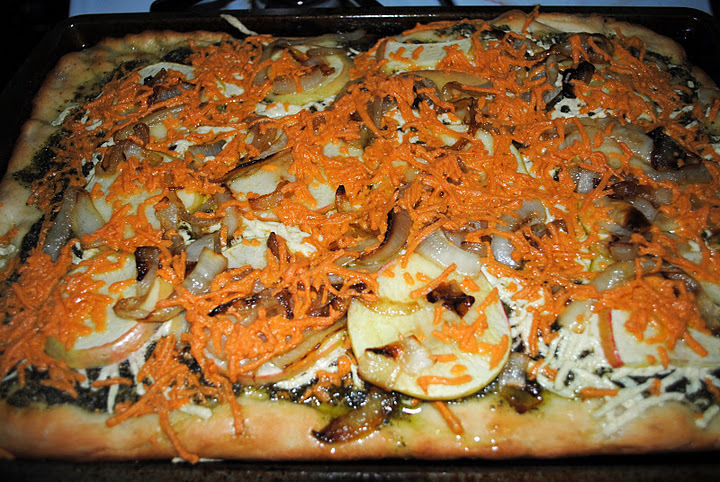 I have this delicious autumn pizza waiting for me in my fridge. Win for me! In the bowl of your electric mixer with an attached dough hook, combine warm water, yeast, honey and oil and mix with a spoon. Let sit for 10-15 minutes until foamy, then add in flour and salt. Mix on low speed until just combined, then turn to medium speed to knead the dough for 5-6 minutes. If it seems to sticky, add a bit more flour 1 tablespoon at a time. 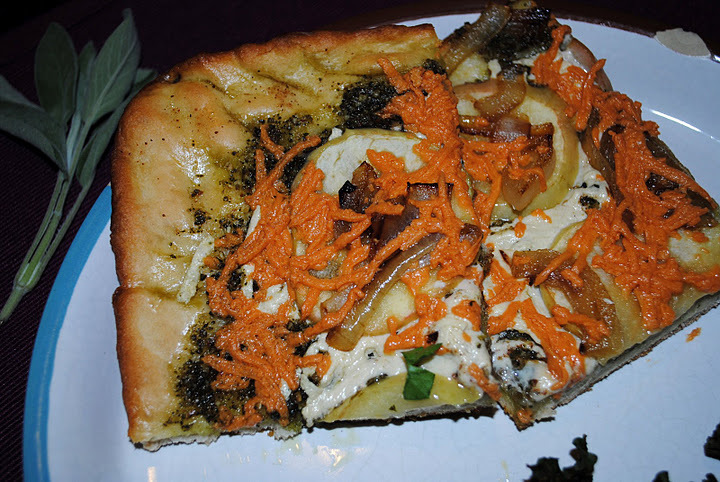 Brush a separate bowl with olive oil, add dough, turning once, then set in a warm place to rise for 1 1/2-2 hours. Cover with a towel. Pulse the ingredients in a food processor in the order given. Scrape down the sides as necessary and continue pulsing to achieve a uniform consistency. 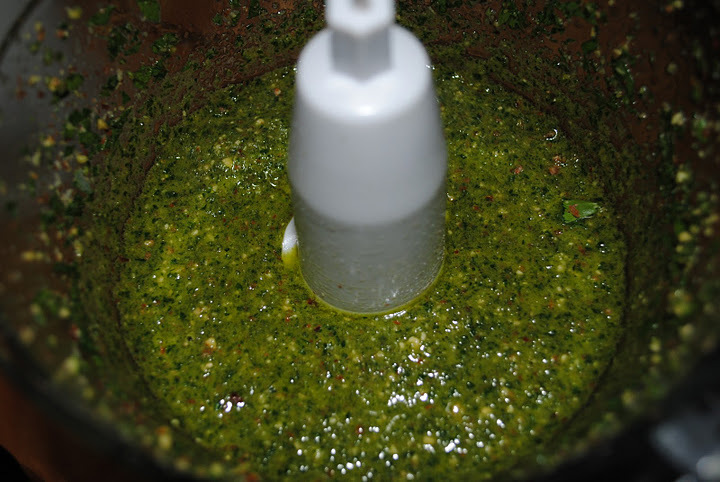 If desired, place sage pesto in a container and top off with olive oil to store. 15 minutes for dough is ready, slice onions. Heat a skillet over medium heat and add 1/2 tablespoon olive oil, then add onions with a sprinkle of salt. Cook, stirring occasionally, until carmelized. In the last minute, add garlic and cook for 60 seconds, then set aside off heat. When your dough is ready, remove from the bowl and place on your greased pizza pan. Stretch out evenly in pan. 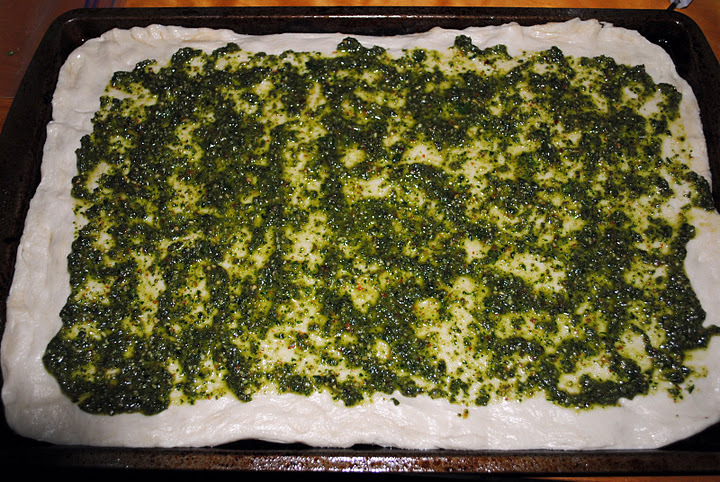 Top with sage pesto ( I used about half of what I made). 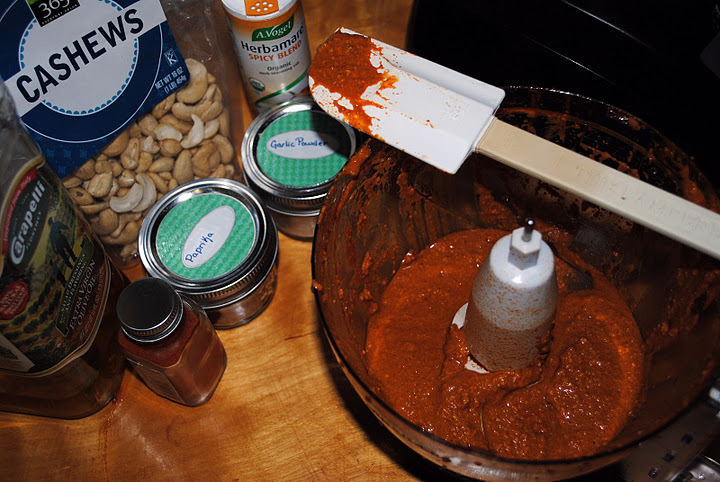 Sprinkle with nutmeg. Add mozzarella cheese. Slice apples (a mandolin slicer would be perfect for this…but I’m not fancy enough for one of those, either) and layer on top of pesto and cheese, then add your onion/garlic mixture. Cover with cheddar cheese. Bake for 25-30 minutes. If you are using vegan bacon, cook in the microwave for about a minute, slice and add to pizza 5 minutes before its finished. I did this with my first round and I didn’t think the vegan bacon added much to the recipe. But what would a pizza be without chip?? Wash kale and remove stem – I just rip it from the stem. 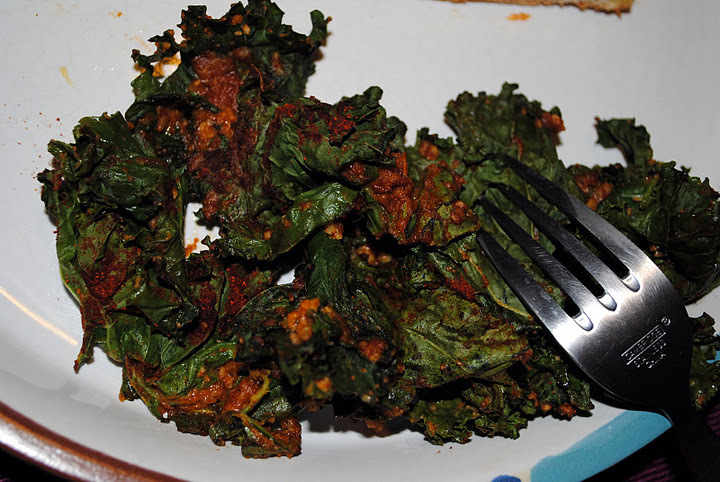 Place kale in a large bowl and cover with 1/4 cup of the paprika mixture. Stir to coat before laying out on prepared cookie sheet. This was my first go-around with kale. I’ve always avoided it because the ruffles kind of creep me out. I’m not a ruffles girl. Pyramid studs- yes. Ruffles- not so much. I was pleased with the results, though! The BBQ sauce definitely had a kick to it but it had really good flavor! Unfortunately, my kale didn’t get chip-like . 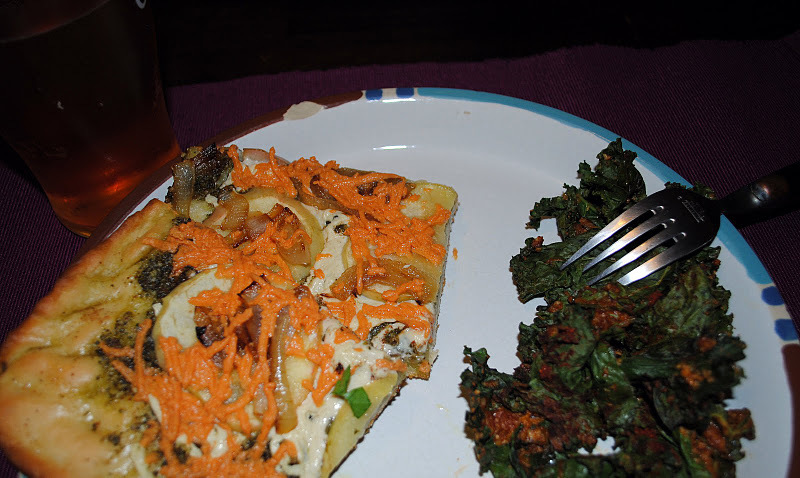 The edges got kind of crispy but overall, the kale was still soft. It still had great flavor, though. I’ll cook it for a bit longer next time. I’m a huge fan of this meal. Then again, I’m a huge fan of pizza and BBQ so I could I not be?? 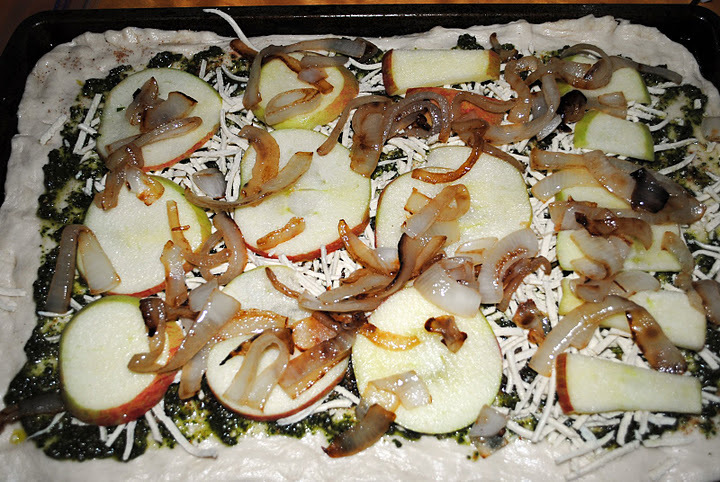 The pizza was light and the apples and nutmeg adds such a great fall feeling. The BBQ sauce on the kale chips was delicious. It created a great new way to eat greens!